Driving west on Route 73 from Rochester toward Brandon Gap last week, you might have noticed a flurry of activity in the fields above the Forest Service CCC Camp. At any given time five excavators, two bulldozers, a skidder, a log loader, and a triaxle dump truck – all from Harvey’s Excavating – were moving and installing 60-foot trees with root wads attached, boulders, and gravel along a 1-mile stretch of the West Branch of the White River. The large trees are being used to create “engineered log jams” that will protect the banks from erosion while creating shade, cover, and food for aquatic and terrestrial life in and along the river. 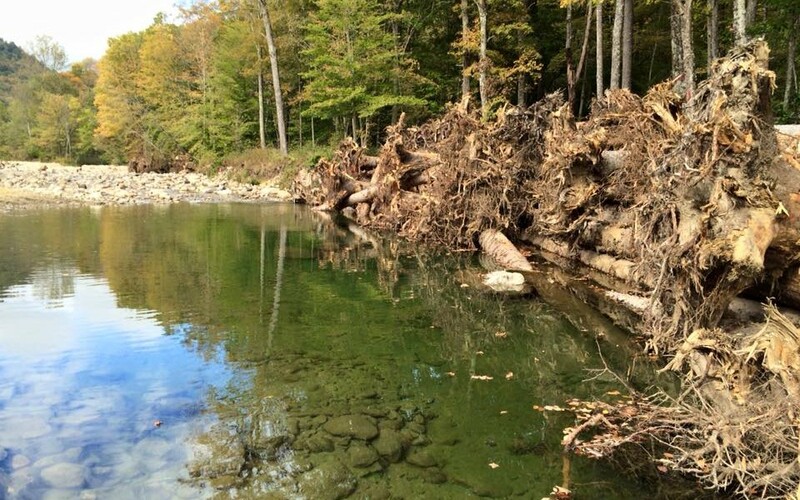 To create the engineered log jam, excavator operators bury several “foundation” trees 40- to 50-feet deep in the riverbank, then weave dozens of successive trees into the buried foundation trees. The resulting structure mimics a natural log jam like those often found along the outside bends of wild, forested streams. Some local residents have expressed concern about putting large trees into the river because of the perception that trees can block culverts and bridges, and cause damages during a flood. But the West Branch project is designed to keep trees in place, which will improve bank stability and reduce the potential for future flood damages. The power of the water rushing through the outside bend strengthens the log jam, pushing the interwoven trunks together tighter and tighter with each high water event. Eventually the trees will decompose, creating rich soil for native trees to establish. The roots of the trees growing in the duff of the decomposing log jam will reinforce the stability of the bank while providing shade, cover, and food for aquatic and terrestrial life. And eventually, when those trees die, they will fall into the river, continuing the natural cycle of wood recruitment. Greg Russ, the Partnership Project Manager, is helping oversee on-the-ground project implementation along with Forest Service, US Fish & Wildlife Service, and State of Vermont biologists, engineers, and river scientists. In addition to building log jams, Russ is working with these technical experts to restore channel dimension and profile by digging pools, building riffles, and creating bends; to stabilize disturbed riverbanks by wrapping coir and coconut fabric around exposed soils and holding the fabric in place with shrub willow stakes; and to reconnect floodplain and flood chutes by removing berms and lowering riverbanks. Next spring the Partnership will work with students and community volunteers to plant native trees along the river, restoring the riparian buffer. In four weeks’ time the West Branch of the White River will look very different than it did in the weeks and months following Tropical Storm Irene. What was a wide, shallow, featureless river will be a meandering stream with deep pools. In time, as riverbank vegetation is restored and water temperatures drop, trout and other native fish will return to pre-flood population levels. And, as a bonus, land along the West Branch will be more resilient to flooding and flood damages. To see pictures and updates about the West Branch restoration project, visit the White River Partnership Facebook page. Or check out the project after the heavy machines are gone; parking is available at the publicly-accessible Forest Service CCC Camp property.